« Business Skills for Creators: Music Industry – Showcase Ready! 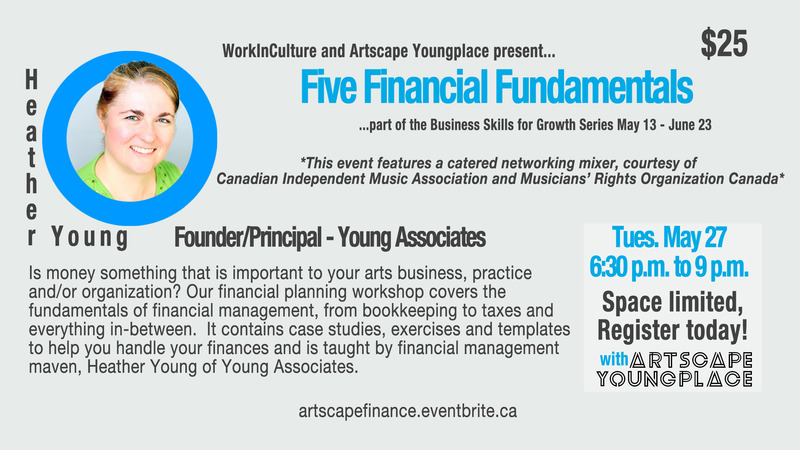 Is money something that is important to your arts business, practice and/or organization? Our financial planning workshop covers the fundamentals of financial management, from bookkeeping to taxes and everything in-between. It contains case studies, exercises and templates to help you handle your finances and is taught by financial management maven, Heather Young of Young Associates. This workshop is being held in partnership with Artscape Launchpad and WorkInCulture with support from the Ontario Trillium Foundation. This workshop is being held in partnership with Artscape Launchpad as a part of the Business Skills for Growth Series. Artscape Launchpad will be a new creative and cultural sector entrepreneurship centre connecting the creative community with the tools, knowledge and space to establish and grow small businesses and commercial projects.